The M270 and M370 are part of WatchGuard’s award-winning Firebox security platform. The platform not only provides the most complete suite of unified security controls on the market today, it has consistently been the first to offer solutions for addressing new and evolving network threats including advanced malware and ransomware. Our unique product architecture enables small and midsize businesses to leverage best-in-class security services – from URL filtering and intrusion prevention to application control and ransomware prevention, minus the cost and complexity of multiple single-point solutions. 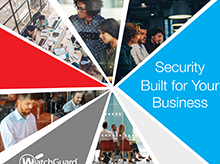 Interactive, real-time monitoring and reporting through WatchGuard Dimension – included at no additional charge – give an unprecedented view into network security activity so you can take immediate preventive or corrective actions. Over 100 reports and dashboards come standard, including reports for PCI and HIPAA compliance, which means you have one-click access to the data you need to ensure compliance requirements are met. SMBs usually have smaller, less technical staff, which can make network expansion challenging. With RapidDeploy – a powerful, cloud-based deployment and configuration tool that comes standard with WatchGuard Firebox appliances, all you have to do is power up the appliance at a remote site and connect it to the Internet. The appliance “phones home” and downloads the correct configuration files from the cloud. Just like that.